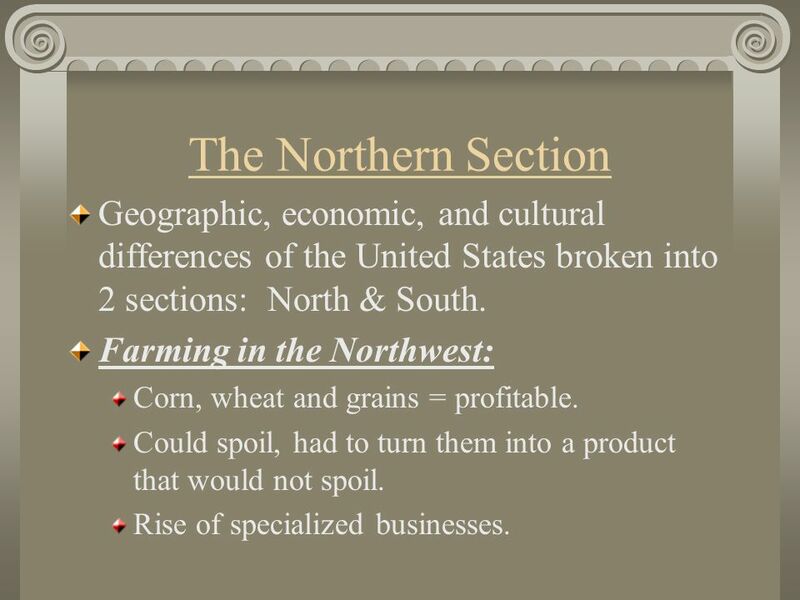 2 The Northern Section Geographic, economic, and cultural differences of the United States broken into 2 sections: North & South. Farming in the Northwest: Corn, wheat and grains = profitable. Could spoil, had to turn them into a product that would not spoil. Rise of specialized businesses. Urban areas: Areas made up mostly of one or more cities. Population Density: The amount of people living within a given space. This greatly increased!!! 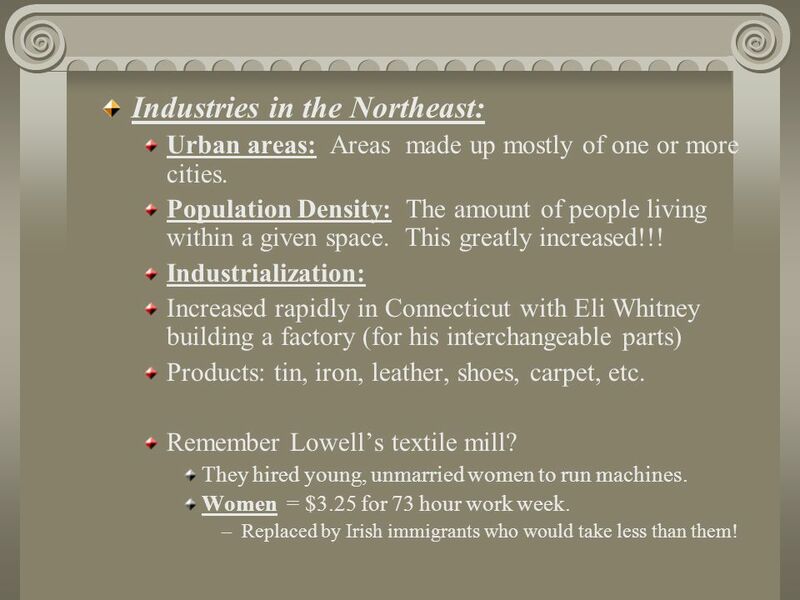 Industrialization: Increased rapidly in Connecticut with Eli Whitney building a factory (for his interchangeable parts) Products: tin, iron, leather, shoes, carpet, etc. Remember Lowell’s textile mill? They hired young, unmarried women to run machines. Women = $3.25 for 73 hour work week. Replaced by Irish immigrants who would take less than them! 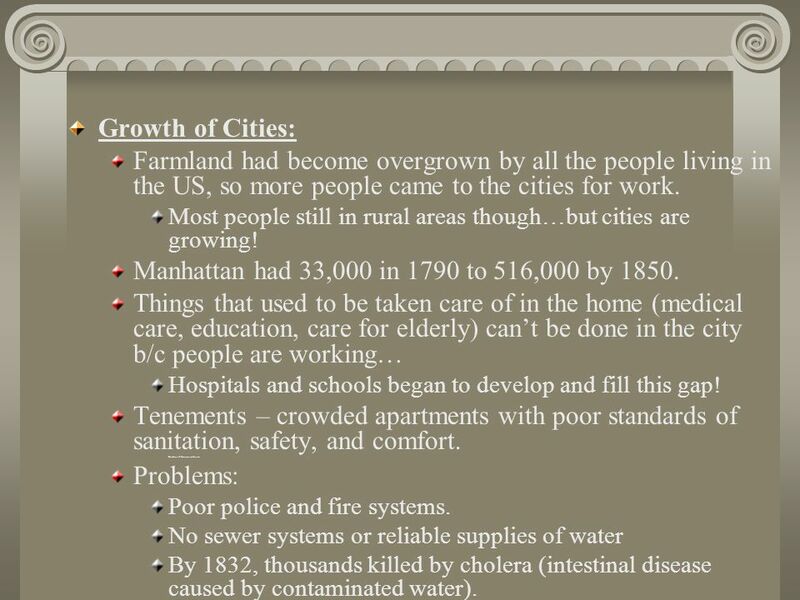 4 Growth of Cities: Farmland had become overgrown by all the people living in the US, so more people came to the cities for work. Most people still in rural areas though…but cities are growing! Manhattan had 33,000 in 1790 to 516,000 by 1850. Things that used to be taken care of in the home (medical care, education, care for elderly) can’t be done in the city b/c people are working… Hospitals and schools began to develop and fill this gap! 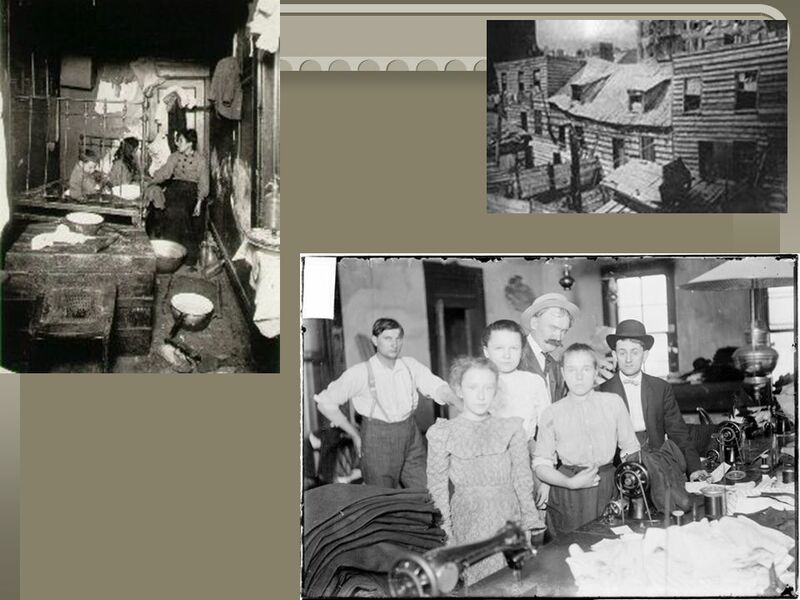 Tenements – crowded apartments with poor standards of sanitation, safety, and comfort. Problems: Number of these was on the rise. Poor police and fire systems. No sewer systems or reliable supplies of water By 1832, thousands killed by cholera (intestinal disease caused by contaminated water). While the North developed, the South stayed rural. Made up of farms and countryside, not cities. Fertile soil and plentiful rain helped farmers. 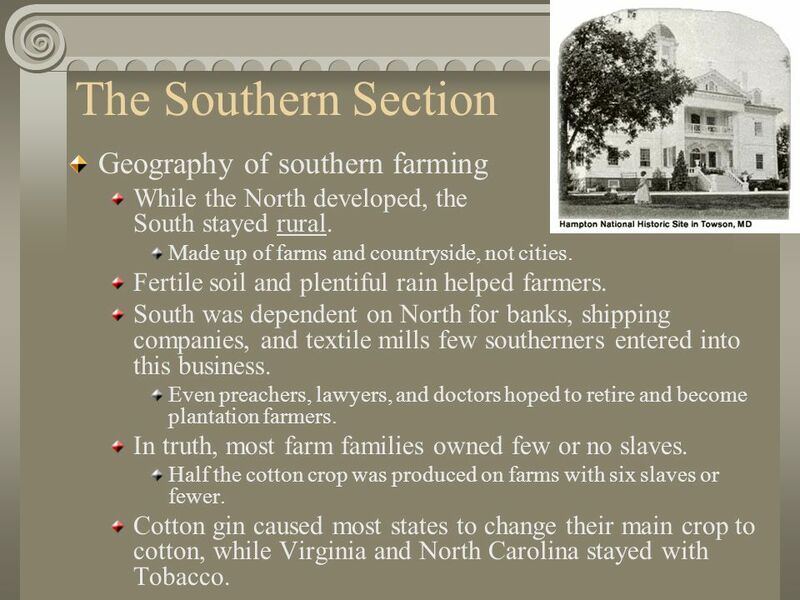 South was dependent on North for banks, shipping companies, and textile mills few southerners entered into this business. Even preachers, lawyers, and doctors hoped to retire and become plantation farmers. In truth, most farm families owned few or no slaves. Half the cotton crop was produced on farms with six slaves or fewer. 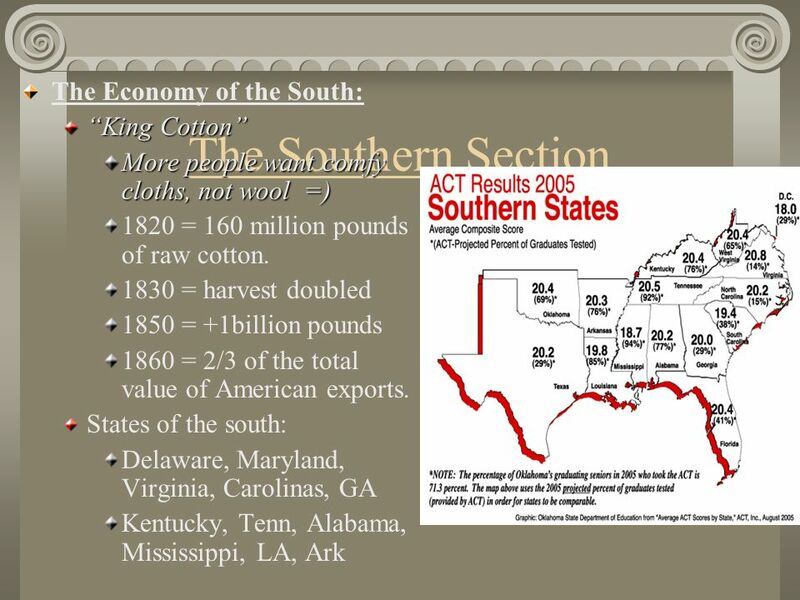 Cotton gin caused most states to change their main crop to cotton, while Virginia and North Carolina stayed with Tobacco. Very slow urban growth. 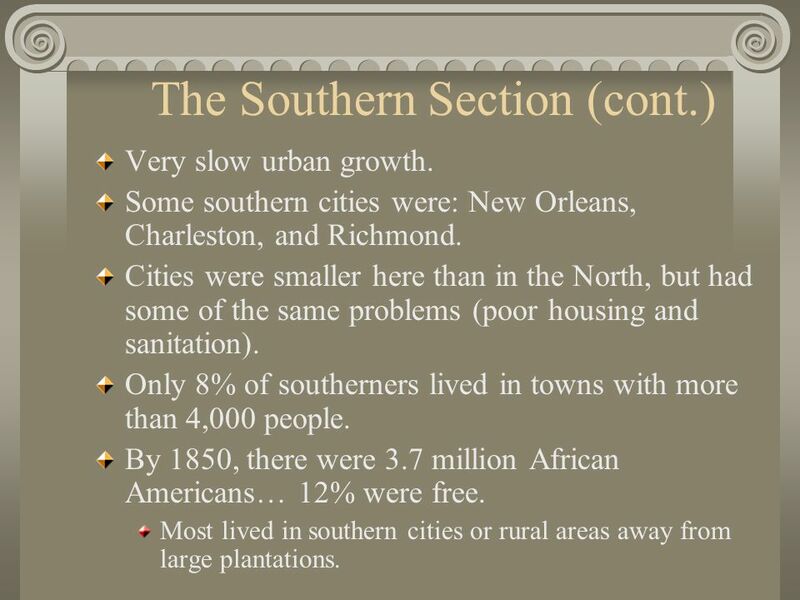 Some southern cities were: New Orleans, Charleston, and Richmond. Cities were smaller here than in the North, but had some of the same problems (poor housing and sanitation). Only 8% of southerners lived in towns with more than 4,000 people. By 1850, there were 3.7 million African Americans… 12% were free. Most lived in southern cities or rural areas away from large plantations. By 1804, all Northern states had banned slavery or passed laws to end it gradually. 1808, Congress banned all further importation of slaves to U.S. 1820, 1.5 million slaves, by 1850 doubled to 3.2 million, and by 1860 the slave population made up half of South Carolina and Mississippi’s population and 2/5 of the population of Florida, Georgia, Alabama, and Louisiana. Life of a Slave: Slaves were property, not people. Price of slaves would rise. 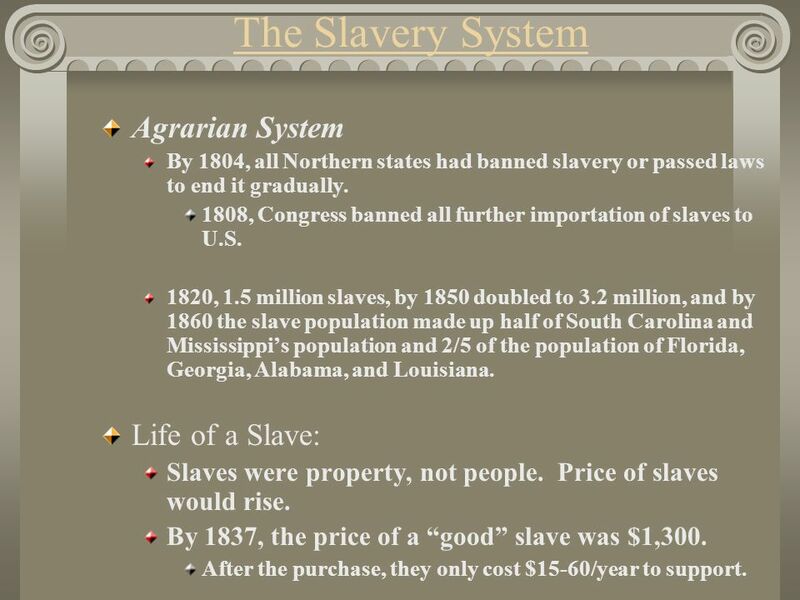 By 1837, the price of a “good” slave was $1,300. After the purchase, they only cost $15-60/year to support. Most slaves lived on these. Lived in sizable community of slaves, usually 20 or more. Tended to be harsher here than on smaller plantations. Workers toiled in gangs under supervision of foremen. Life really bad for women. Baring/caring for children, took care of houses, cooked/served food, cleaned houses and clothes, labored in fields. 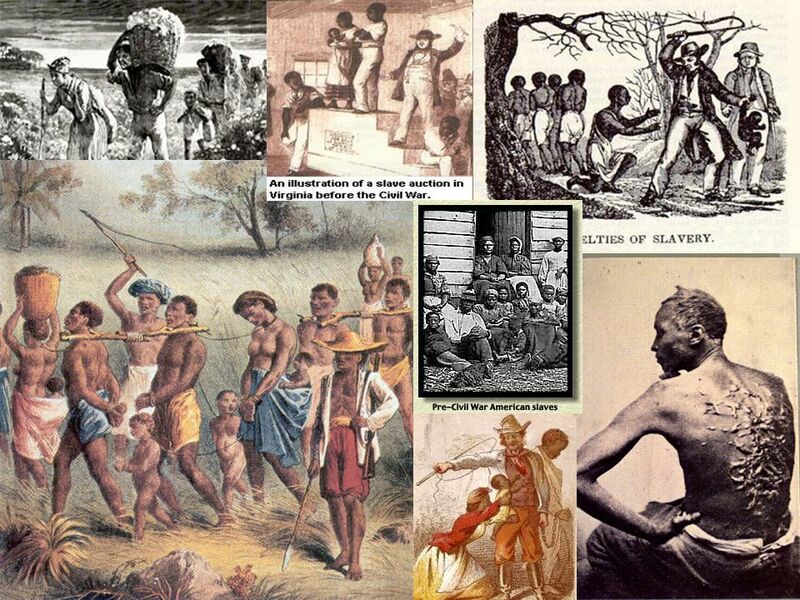 Some had to endure the threat of physical or sexual abuse by their slave owners. Slaves often worked side by side with their owners in the field. Sometimes ate together and slept in the same house. 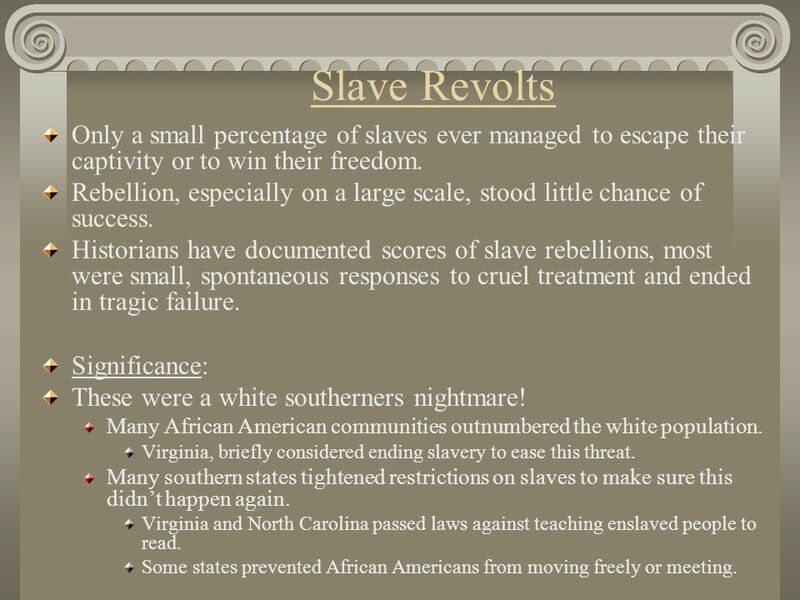 12 Slave Revolts Only a small percentage of slaves ever managed to escape their captivity or to win their freedom. Rebellion, especially on a large scale, stood little chance of success. Historians have documented scores of slave rebellions, most were small, spontaneous responses to cruel treatment and ended in tragic failure. Significance: These were a white southerners nightmare! Many African American communities outnumbered the white population. 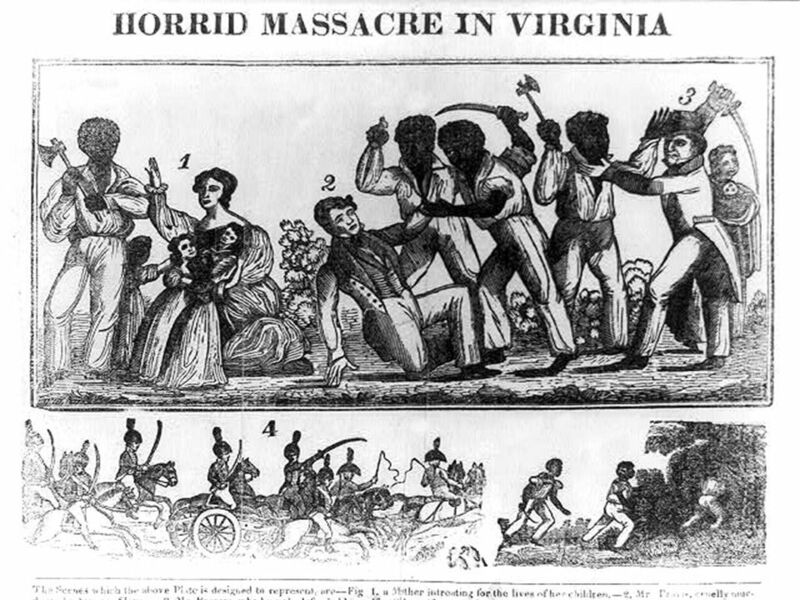 Virginia, briefly considered ending slavery to ease this threat. Many southern states tightened restrictions on slaves to make sure this didn’t happen again. Virginia and North Carolina passed laws against teaching enslaved people to read. Some states prevented African Americans from moving freely or meeting. 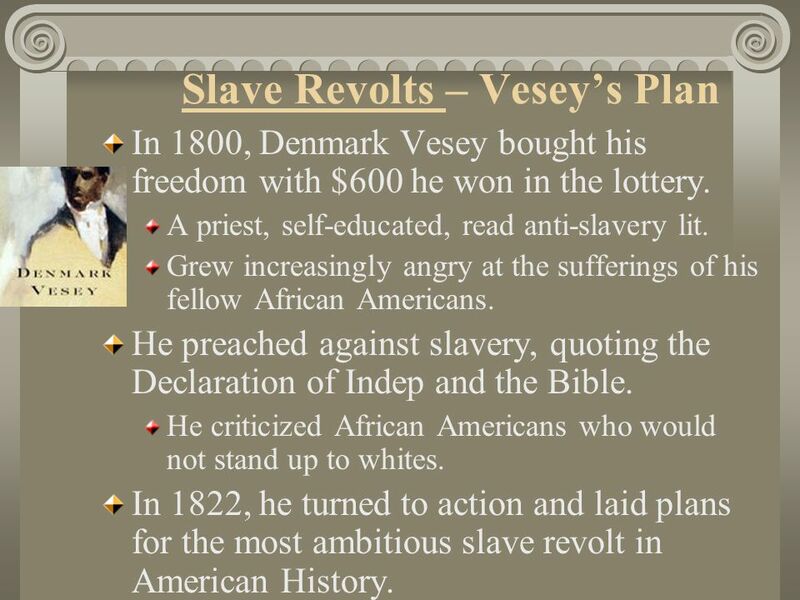 In 1800, Denmark Vesey bought his freedom with $600 he won in the lottery. A priest, self-educated, read anti-slavery lit. Grew increasingly angry at the sufferings of his fellow African Americans. He preached against slavery, quoting the Declaration of Indep and the Bible. He criticized African Americans who would not stand up to whites. In 1822, he turned to action and laid plans for the most ambitious slave revolt in American History. Involved hundreds (or thousands) of rebels. 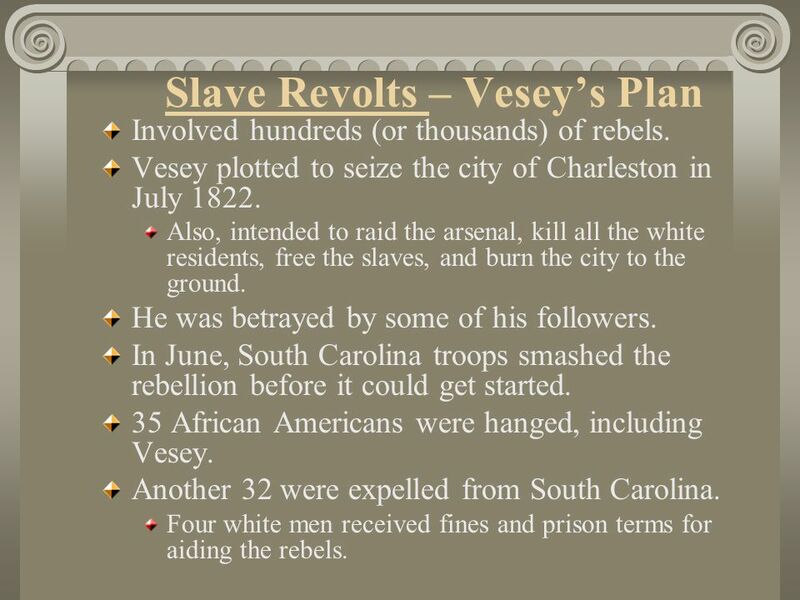 Vesey plotted to seize the city of Charleston in July 1822. Also, intended to raid the arsenal, kill all the white residents, free the slaves, and burn the city to the ground. He was betrayed by some of his followers. In June, South Carolina troops smashed the rebellion before it could get started. 35 African Americans were hanged, including Vesey. Another 32 were expelled from South Carolina. Four white men received fines and prison terms for aiding the rebels. 31 year old African American preacher. He planned and carried out a violent uprising in Aug Acting under what he believed was divine inspiration, he led about 70 slaves in raids on white families in southeastern VA. Attacked 4 plantations, they killed 57 white people. Local militia captured most of the rebels. 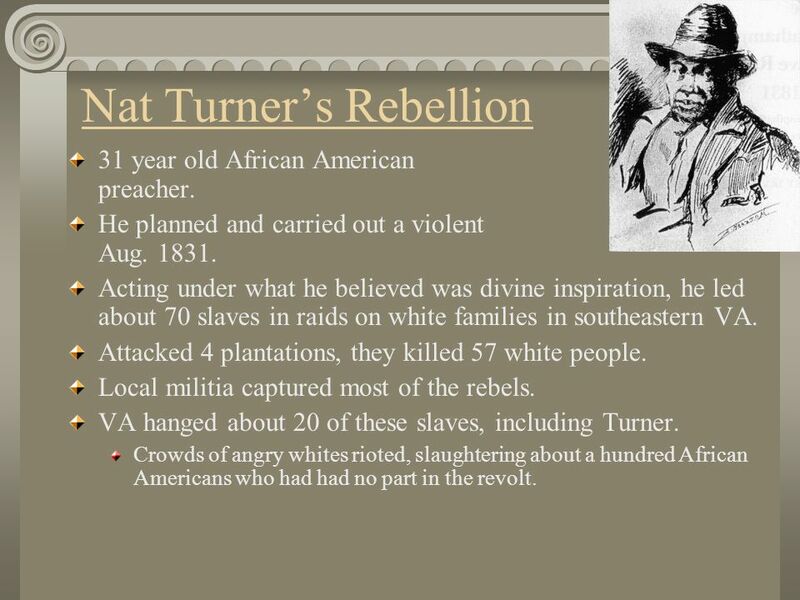 VA hanged about 20 of these slaves, including Turner. Crowds of angry whites rioted, slaughtering about a hundred African Americans who had had no part in the revolt. 17 Few Other Problems… Poverty, alcoholism, illiteracy, overcrowded housing, poor health care, abuse of women, declining moral values. These problems plagued cities early on. 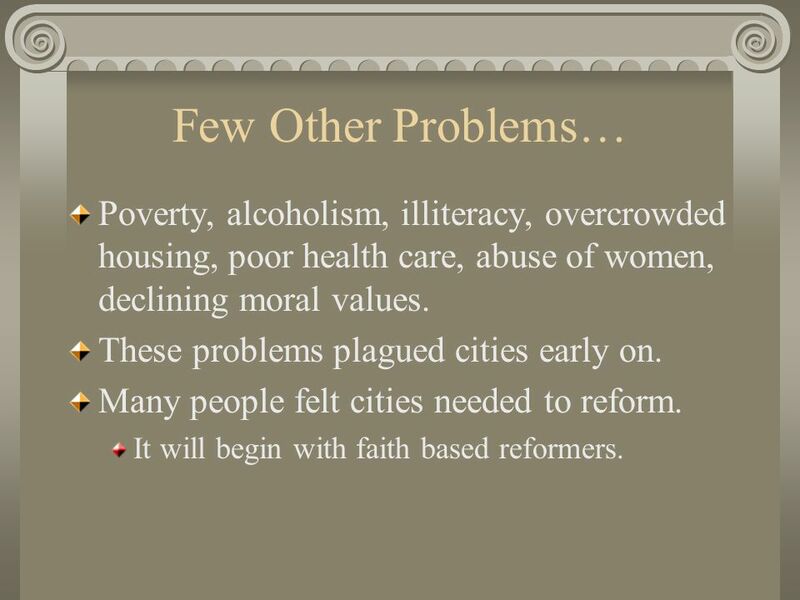 Many people felt cities needed to reform. It will begin with faith based reformers. Democratic! Anyone, rich or poor, could win salvation Evangelical religions stressed the importance of the congregation (people of the church) other than the ministers. Common feature – revival A gathering where people were revived, or brought back to religious life, by listening to preachers and accepting Jesus Christ. 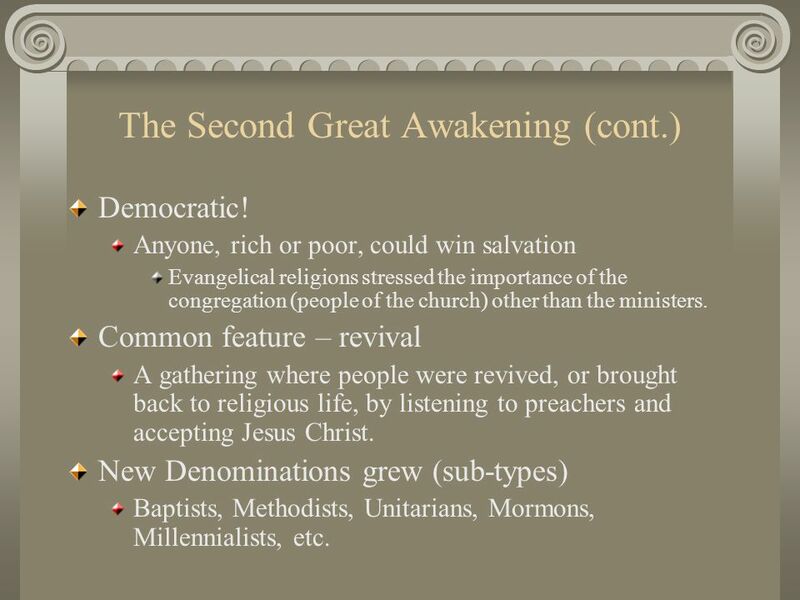 New Denominations grew (sub-types) Baptists, Methodists, Unitarians, Mormons, Millennialists, etc. 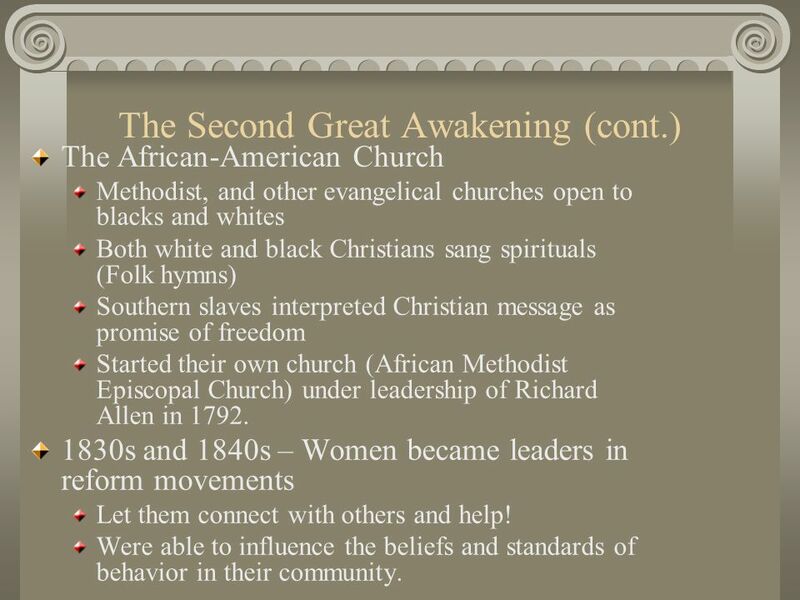 The African-American Church Methodist, and other evangelical churches open to blacks and whites Both white and black Christians sang spirituals (Folk hymns) Southern slaves interpreted Christian message as promise of freedom Started their own church (African Methodist Episcopal Church) under leadership of Richard Allen in 1792. 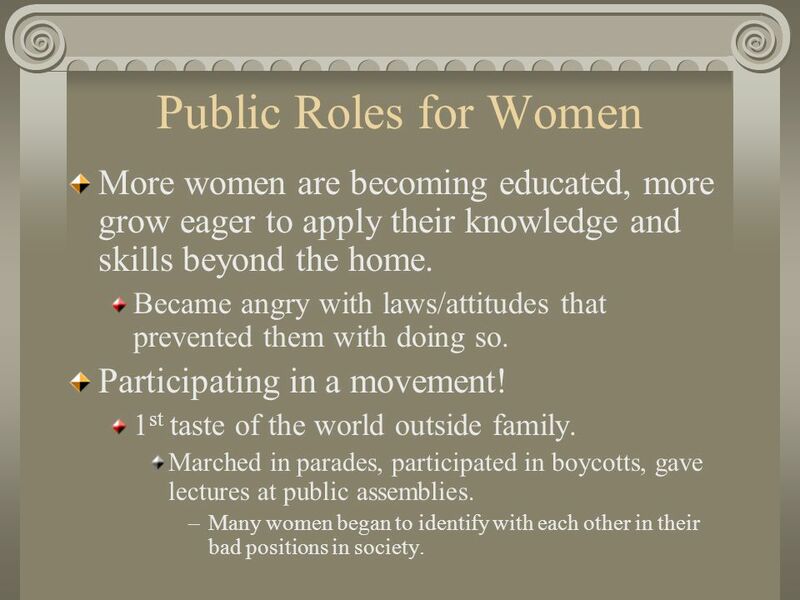 1830s and 1840s – Women became leaders in reform movements Let them connect with others and help! Were able to influence the beliefs and standards of behavior in their community. Protestant Revivalists: believed that God was all-powerful but that God allowed people to make their own destinies. Charles Grandison Finney: Central figure Preached with passion and fire! 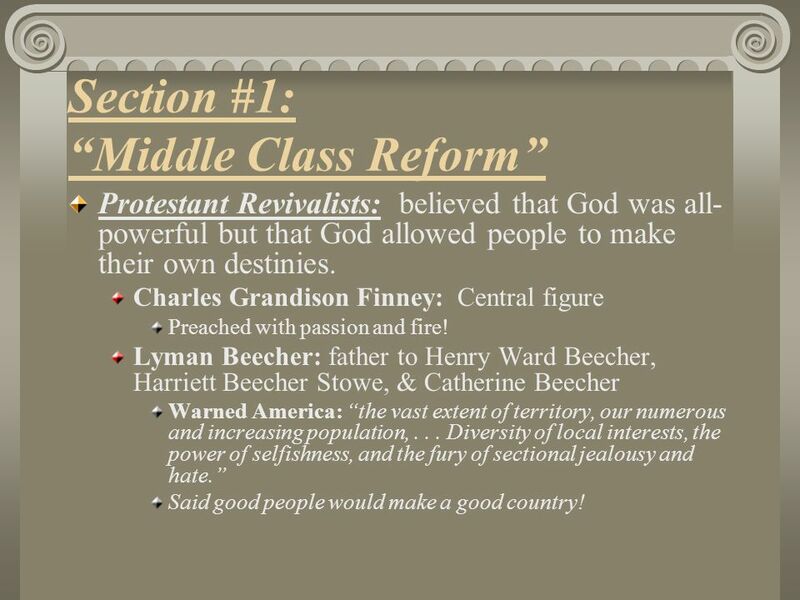 Lyman Beecher: father to Henry Ward Beecher, Harriett Beecher Stowe, & Catherine Beecher Warned America: “the vast extent of territory, our numerous and increasing population, Diversity of local interests, the power of selfishness, and the fury of sectional jealousy and hate.” Said good people would make a good country! 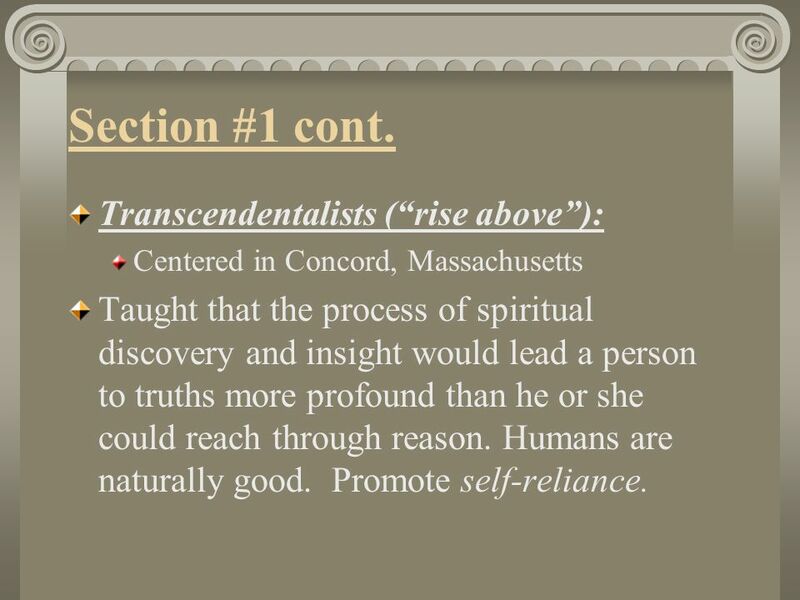 Centered in Concord, Massachusetts Taught that the process of spiritual discovery and insight would lead a person to truths more profound than he or she could reach through reason. Humans are naturally good. Promote self-reliance. Suffered tragedy to make him question… Failed at teaching, broken engagement, death of brother. Built a cabin on lake Walden and spent 2 years writing and thinking. 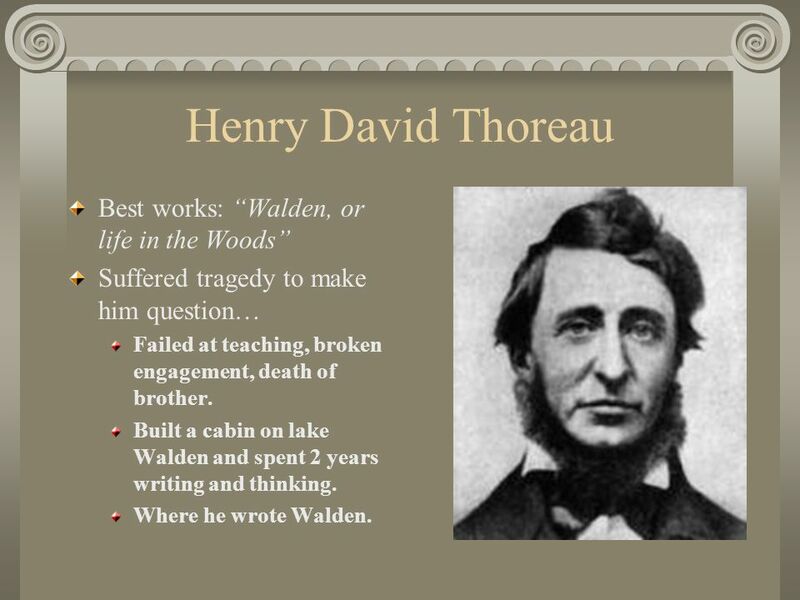 Where he wrote Walden. “Why should we be in such desperate haste to succeed, and in such desperate enterprises? If a man does not keep pace with his companions, perhaps it is because he hears a different drummer. 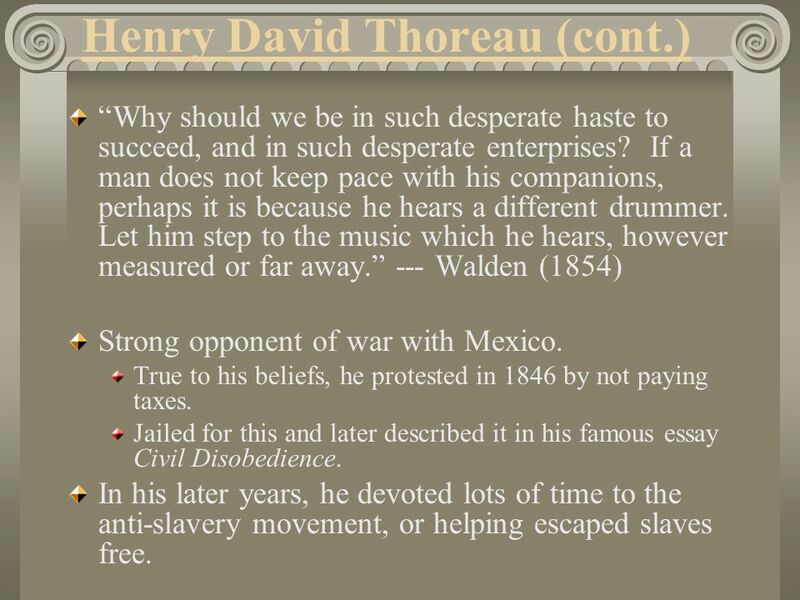 Let him step to the music which he hears, however measured or far away.” --- Walden (1854) Strong opponent of war with Mexico. True to his beliefs, he protested in 1846 by not paying taxes. Jailed for this and later described it in his famous essay Civil Disobedience. 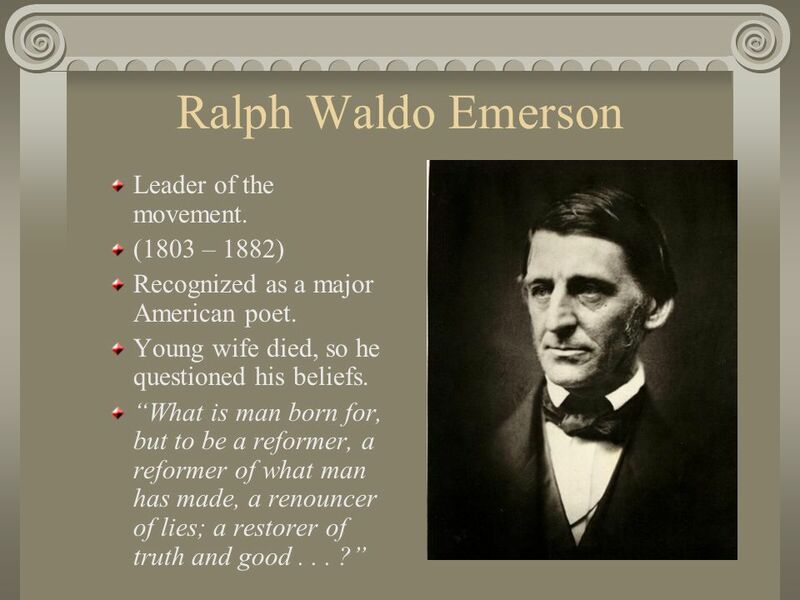 In his later years, he devoted lots of time to the anti-slavery movement, or helping escaped slaves free. Social problem of the early 1800’s. At this point, Americans consumed more alcoholic beverages per person than any other time in the country's history. An organized campaign to eliminate alcohol consumption. 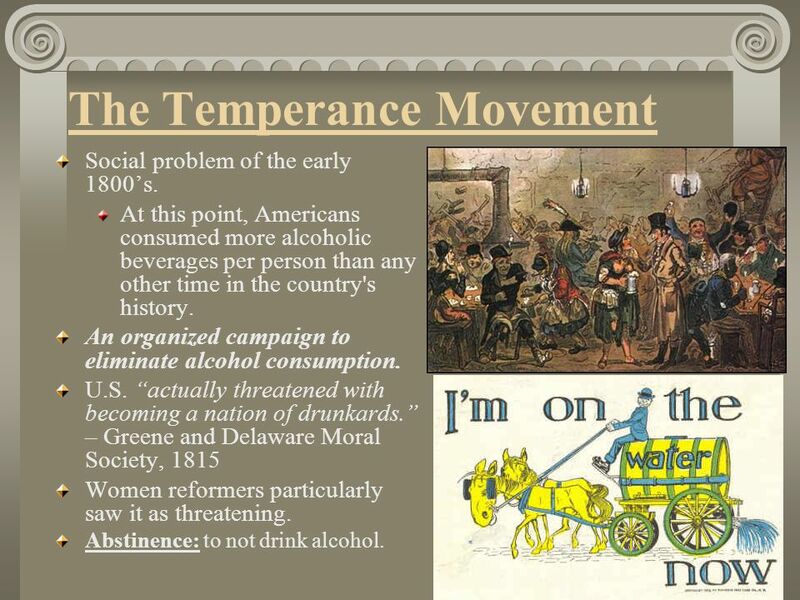 U.S. “actually threatened with becoming a nation of drunkards.” – Greene and Delaware Moral Society, 1815 Women reformers particularly saw it as threatening. Abstinence: to not drink alcohol. By 1834 the American Temperance Society had 7,000 local organizations with 1,250,000 members. 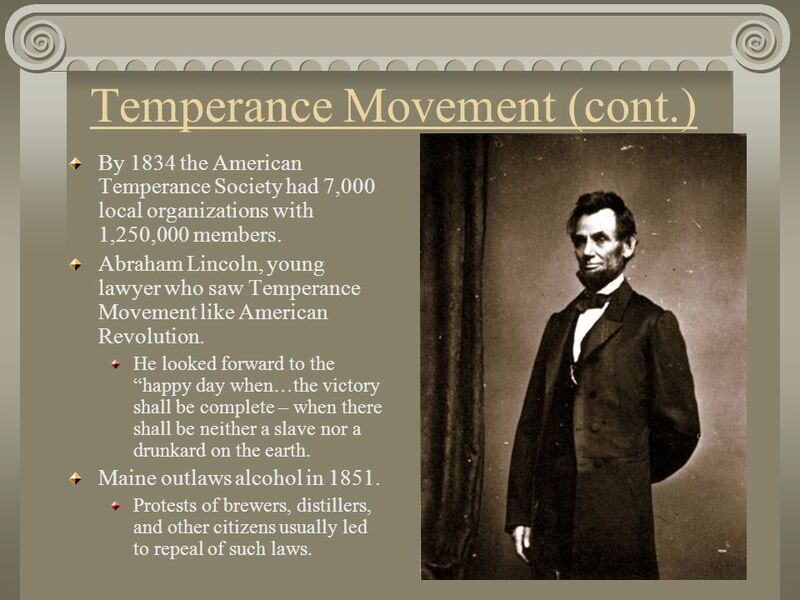 Abraham Lincoln, young lawyer who saw Temperance Movement like American Revolution. He looked forward to the “happy day when…the victory shall be complete – when there shall be neither a slave nor a drunkard on the earth. Maine outlaws alcohol in 1851. Protests of brewers, distillers, and other citizens usually led to repeal of such laws. 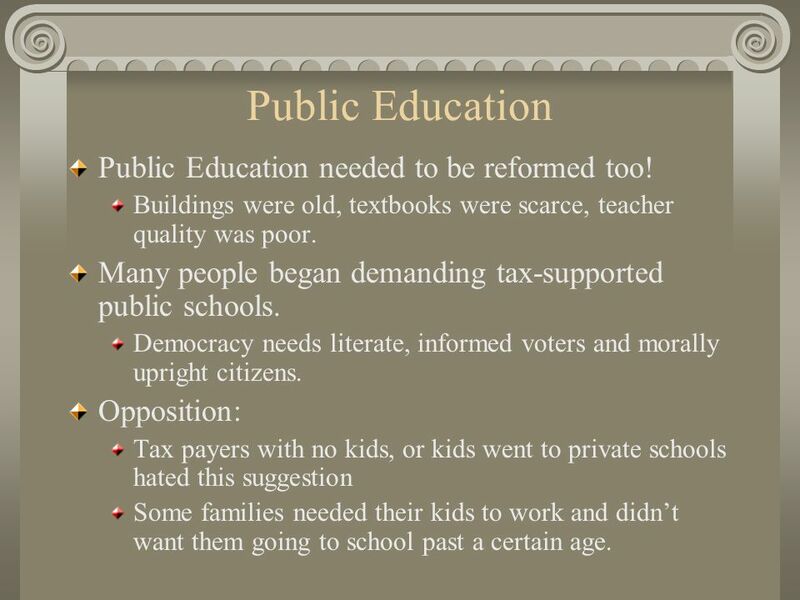 28 Public Education Public Education needed to be reformed too! Buildings were old, textbooks were scarce, teacher quality was poor. Many people began demanding tax-supported public schools. Democracy needs literate, informed voters and morally upright citizens. Opposition: Tax payers with no kids, or kids went to private schools hated this suggestion Some families needed their kids to work and didn’t want them going to school past a certain age. 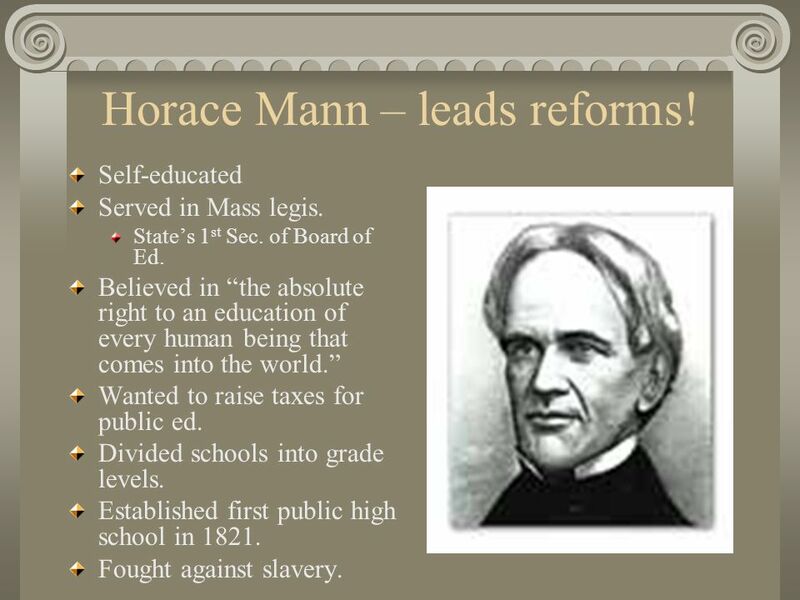 29 Horace Mann – leads reforms! Self-educated Served in Mass legis. State’s 1st Sec. of Board of Ed. Believed in “the absolute right to an education of every human being that comes into the world.” Wanted to raise taxes for public ed. Divided schools into grade levels. Established first public high school in 1821. Fought against slavery. 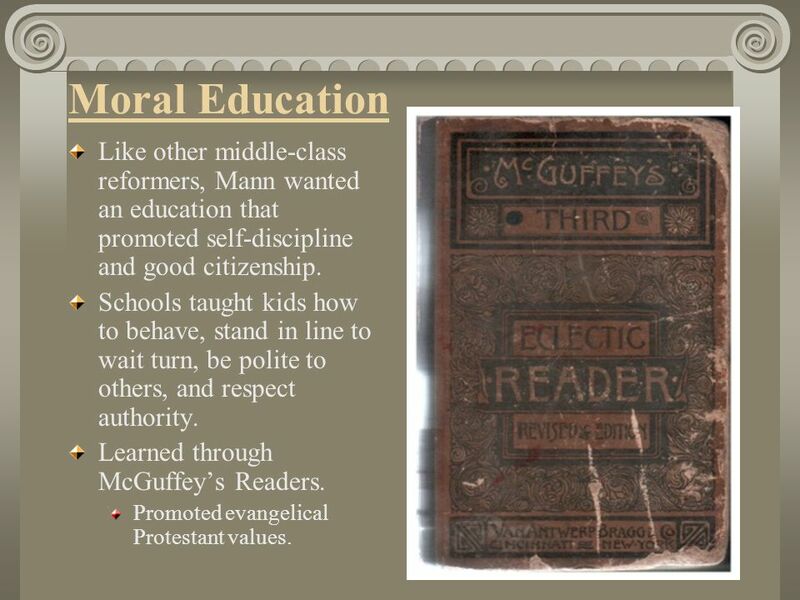 30 Moral Education Like other middle-class reformers, Mann wanted an education that promoted self-discipline and good citizenship. Schools taught kids how to behave, stand in line to wait turn, be polite to others, and respect authority. Learned through McGuffey’s Readers. Promoted evangelical Protestant values. 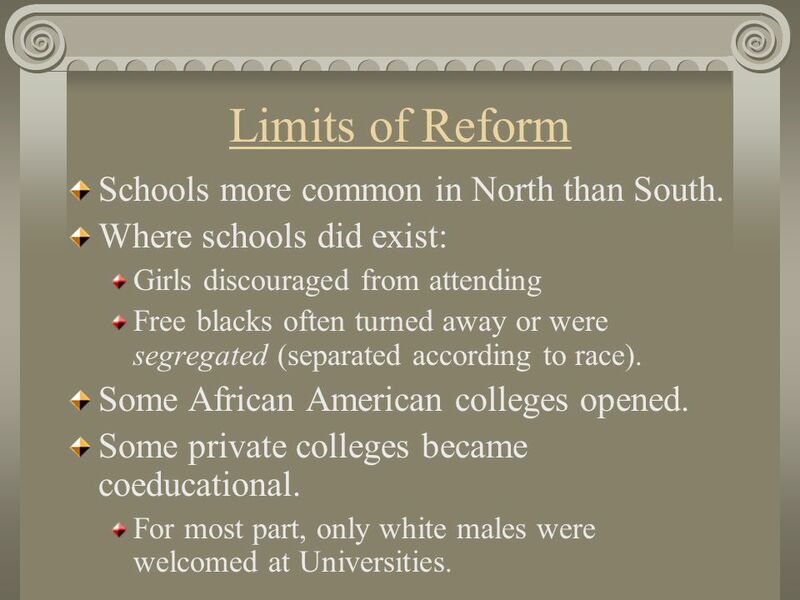 31 Limits of Reform Schools more common in North than South. Where schools did exist: Girls discouraged from attending Free blacks often turned away or were segregated (separated according to race). Some African American colleges opened. Some private colleges became coeducational. For most part, only white males were welcomed at Universities. She discovered all kinds of people (men, women, young/old, sane/insane, first-timers, and repeat offenders) all together in bad conditions. Dressed in rags Poorly fed Chained together in unheated cells Spent next 2 years going to all prisons in Mass. Submitted findings to Mass legislature. 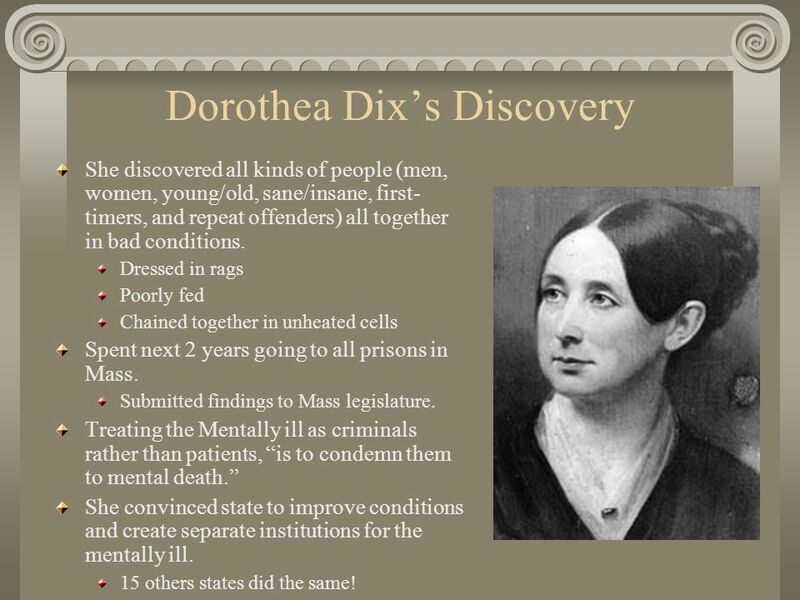 Treating the Mentally ill as criminals rather than patients, “is to condemn them to mental death.” She convinced state to improve conditions and create separate institutions for the mentally ill. 15 others states did the same! 34 Utopian Communities Most reformers worked to improve society at large, while some formed Utopian Communities. Small societies dedicated to perfection in social and political conditions. Utopia, appeared in literature earlier. Described a place where human greed, sin, and egotism did not exists, and people lived in prosperity as equals. 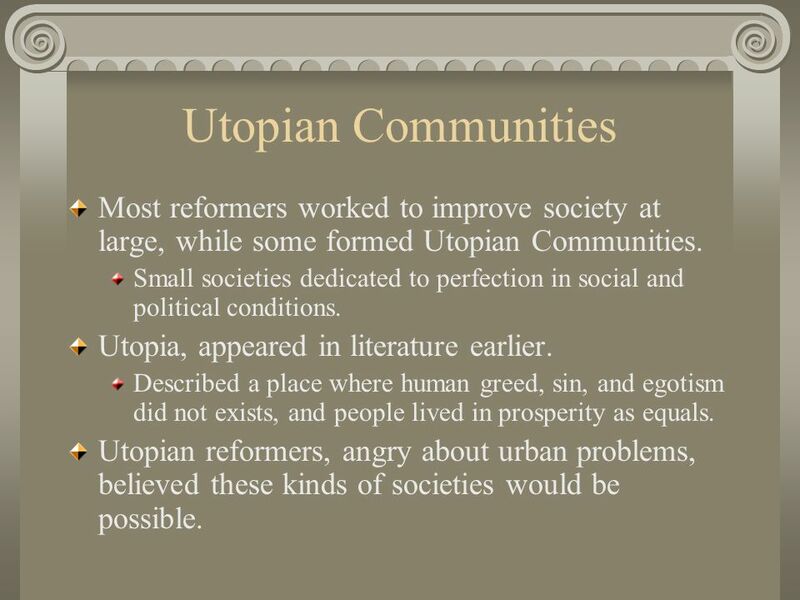 Utopian reformers, angry about urban problems, believed these kinds of societies would be possible. 35 Not so much… First half of 1800’s, 100 communities arose. 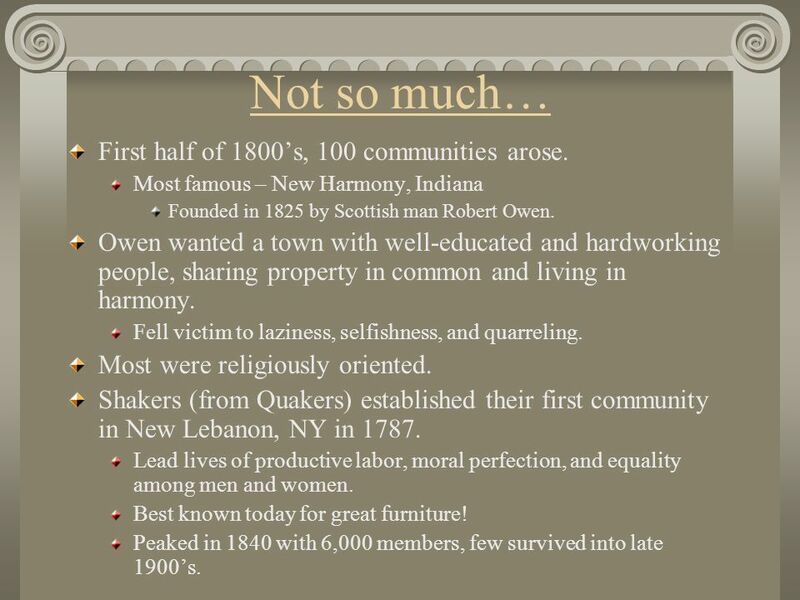 Most famous – New Harmony, Indiana Founded in 1825 by Scottish man Robert Owen. Owen wanted a town with well-educated and hardworking people, sharing property in common and living in harmony. Fell victim to laziness, selfishness, and quarreling. Most were religiously oriented. Shakers (from Quakers) established their first community in New Lebanon, NY in 1787. Lead lives of productive labor, moral perfection, and equality among men and women. Best known today for great furniture! Peaked in 1840 with 6,000 members, few survived into late 1900’s. David Walker spread his message interestingly. He bought cloths from sailors returning to port, put copies of his pamphlet “Appeal to the Colored Citizens of the World” in them, and then resold the. He said white people should all cooperate so that all Americans can “live in peace and happiness together.” But if they would not listen he warned, “We must and shall be free…in spite of [white people], for America is as much our country as it is yours. Angry southerners in response to antislavery literature, ban anti-slavery publications and made it illegal to teach slaves to read. 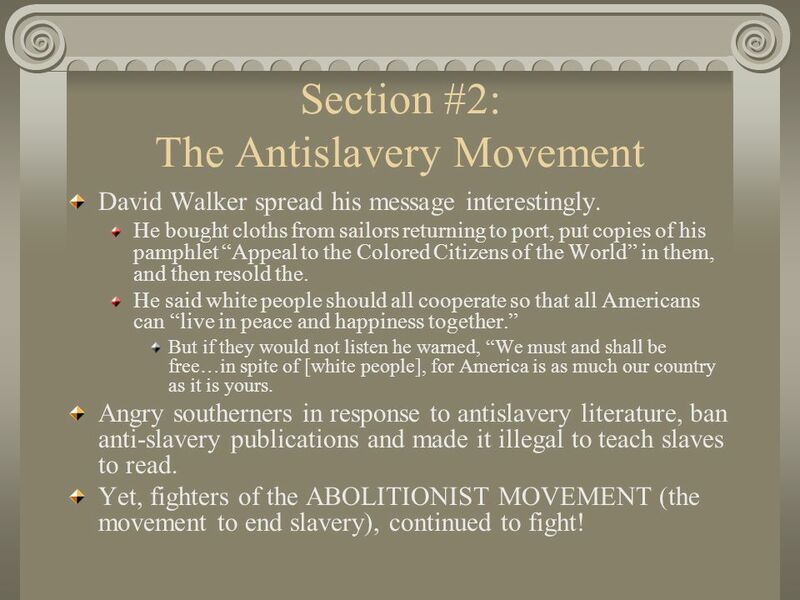 Yet, fighters of the ABOLITIONIST MOVEMENT (the movement to end slavery), continued to fight! 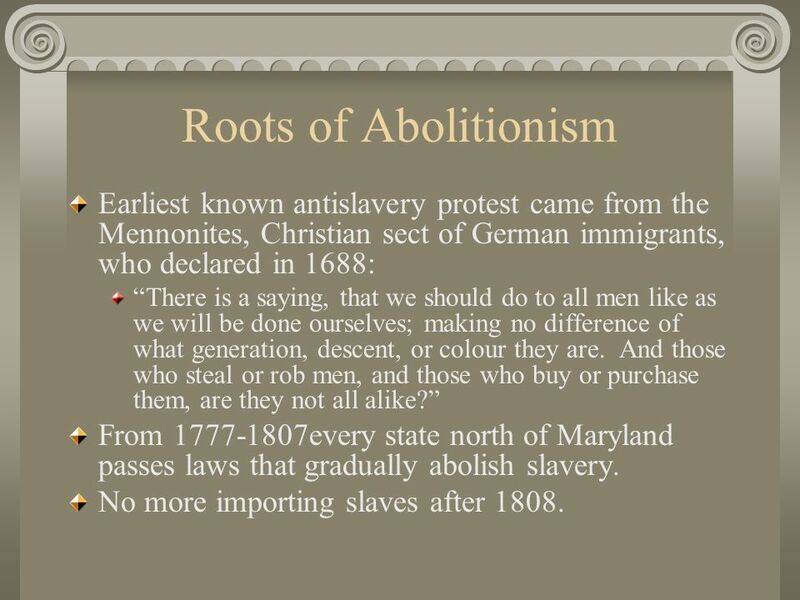 37 Roots of Abolitionism Earliest known antislavery protest came from the Mennonites, Christian sect of German immigrants, who declared in 1688: “There is a saying, that we should do to all men like as we will be done ourselves; making no difference of what generation, descent, or colour they are. And those who steal or rob men, and those who buy or purchase them, are they not all alike?” From every state north of Maryland passes laws that gradually abolish slavery. No more importing slaves after 1808. 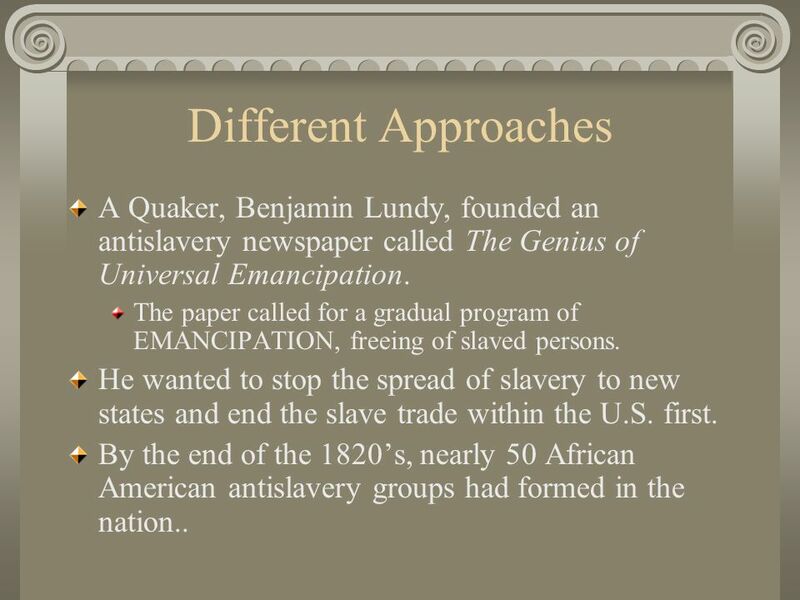 38 Different Approaches A Quaker, Benjamin Lundy, founded an antislavery newspaper called The Genius of Universal Emancipation. The paper called for a gradual program of EMANCIPATION, freeing of slaved persons. He wanted to stop the spread of slavery to new states and end the slave trade within the U.S. first. By the end of the 1820’s, nearly 50 African American antislavery groups had formed in the nation.. 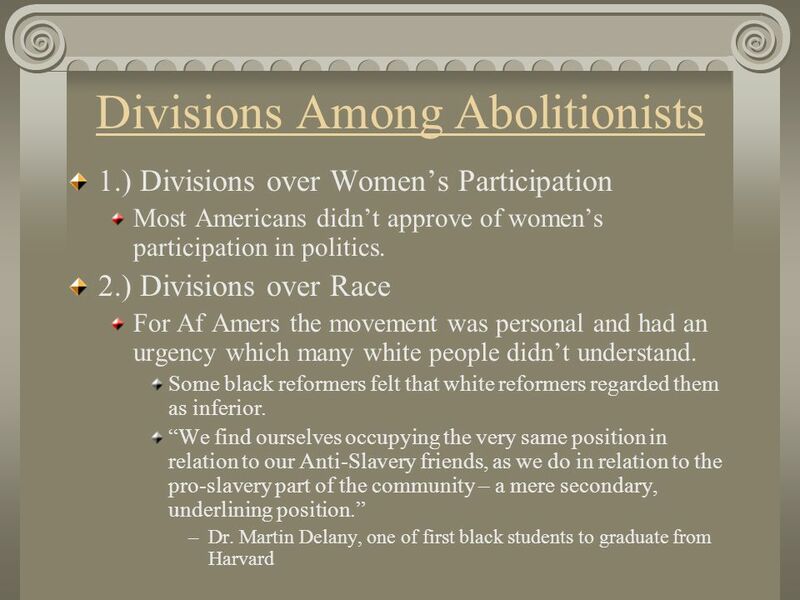 Early 1800’s some abolitionists favored COLONIZATION, a program to send free blacks and emancipated slaves to Africa. Thinking Af. Amers. would never be treated equally, these abolitionists formed the American Colonization Society in 1816. 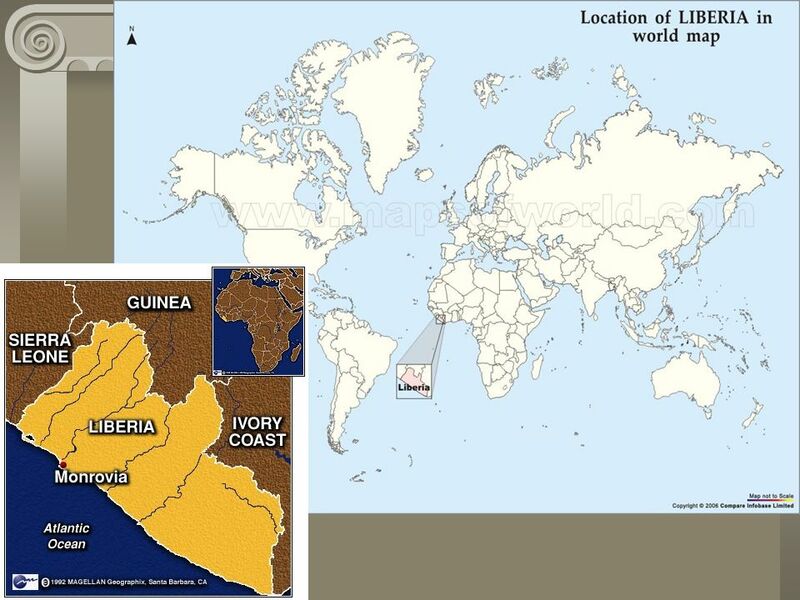 They established the West African country of Liberia (sounds like Liberty!) in 1822. Many white supporters of this didn’t believe in racial equality. Many wanted to rid the US of slavery & African Americans. Some felt this would be good and not allow for slave revolts! Tended to offend African Americans. 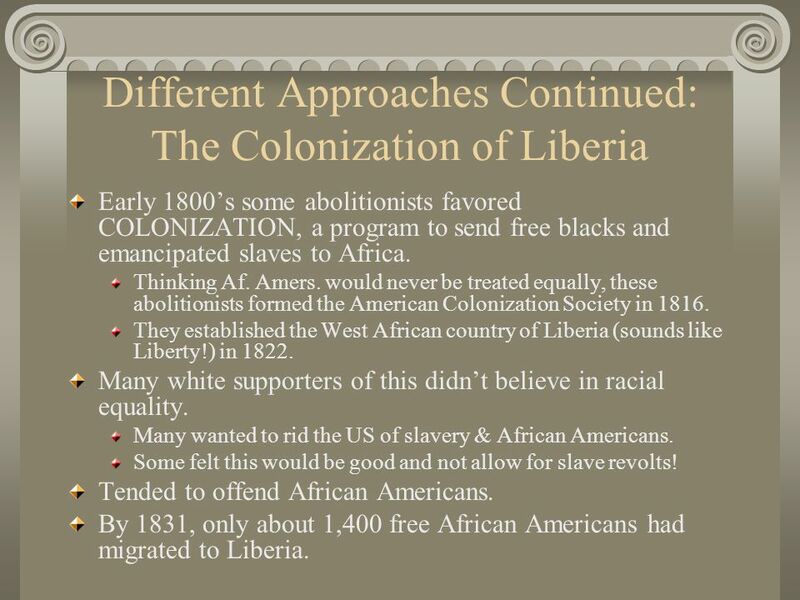 By 1831, only about 1,400 free African Americans had migrated to Liberia. 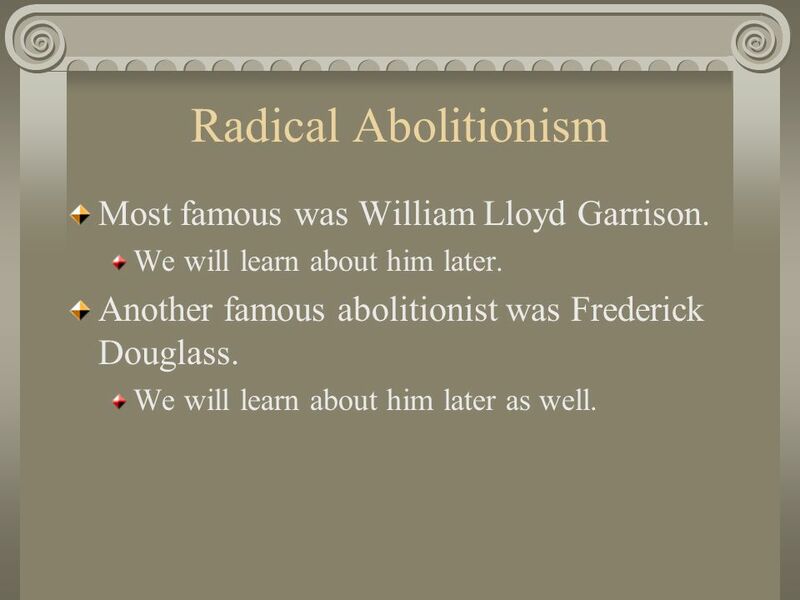 41 Radical Abolitionism Most famous was William Lloyd Garrison. We will learn about him later. Another famous abolitionist was Frederick Douglass. We will learn about him later as well. 3.) 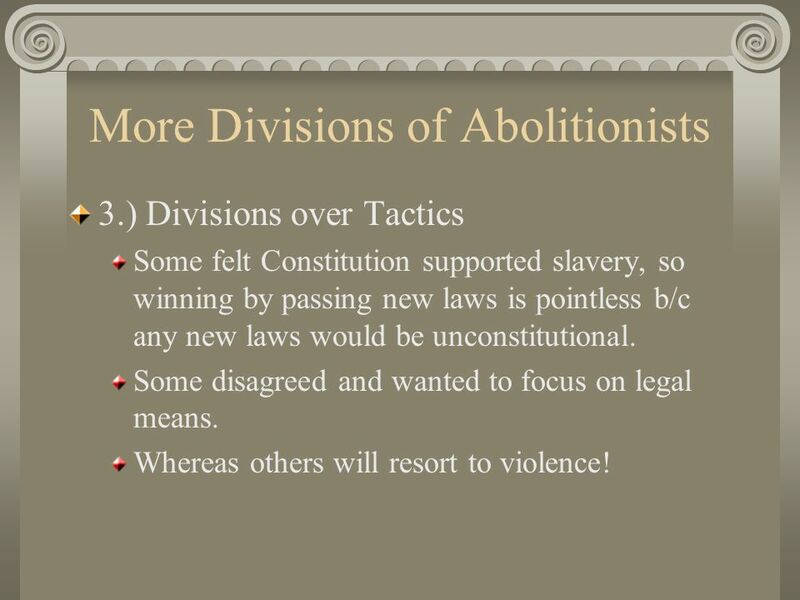 Divisions over Tactics Some felt Constitution supported slavery, so winning by passing new laws is pointless b/c any new laws would be unconstitutional. Some disagreed and wanted to focus on legal means. Whereas others will resort to violence! 44 The Underground RR Some reformers relied on other means to attack slavery, both legal and illegal. 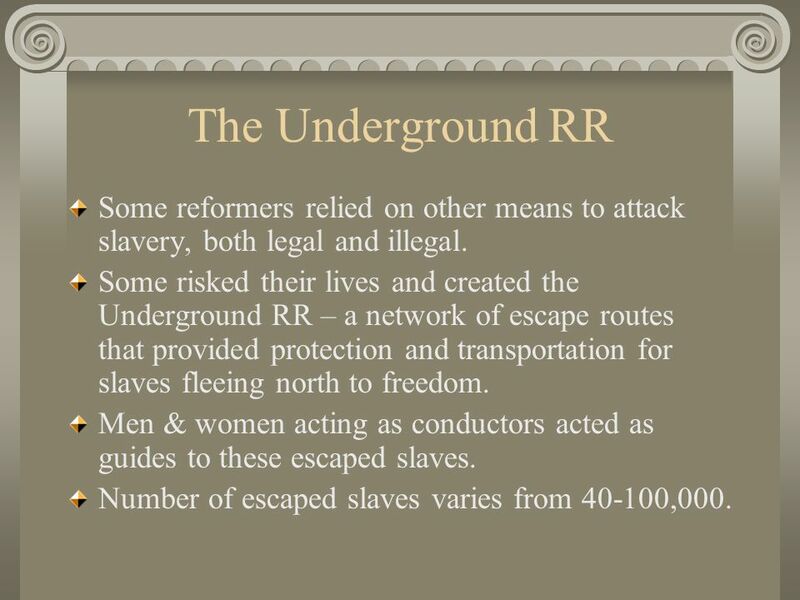 Some risked their lives and created the Underground RR – a network of escape routes that provided protection and transportation for slaves fleeing north to freedom. Men & women acting as conductors acted as guides to these escaped slaves. Number of escaped slaves varies from ,000. 45 Resistance to Abolitionism… In the North?!? 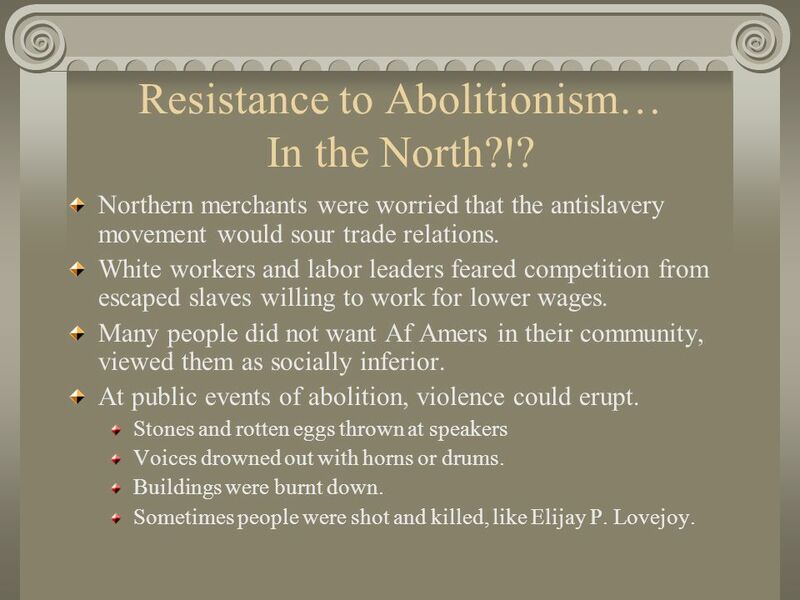 Northern merchants were worried that the antislavery movement would sour trade relations. White workers and labor leaders feared competition from escaped slaves willing to work for lower wages. Many people did not want Af Amers in their community, viewed them as socially inferior. At public events of abolition, violence could erupt. Stones and rotten eggs thrown at speakers Voices drowned out with horns or drums. Buildings were burnt down. Sometimes people were shot and killed, like Elijay P. Lovejoy. Most southerners were angered by the criticisms leveled at slavery. Attacks by abolitionists made many more southerners determined to defend slavery. It was very dangerous for southerners to speak against slavery. Southern postmasters refused to deliver abolitionist literature. 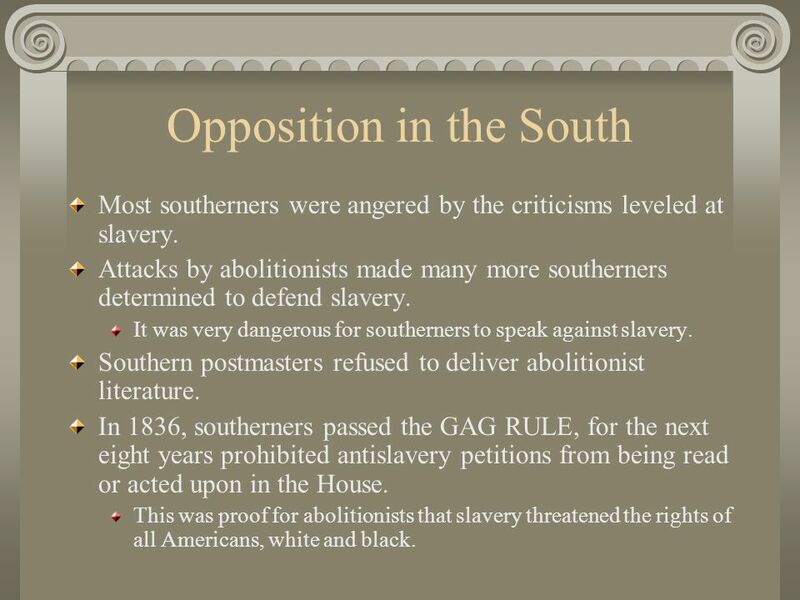 In 1836, southerners passed the GAG RULE, for the next eight years prohibited antislavery petitions from being read or acted upon in the House. This was proof for abolitionists that slavery threatened the rights of all Americans, white and black. Reformers believed that women were central to success of a strong, democratic nation. 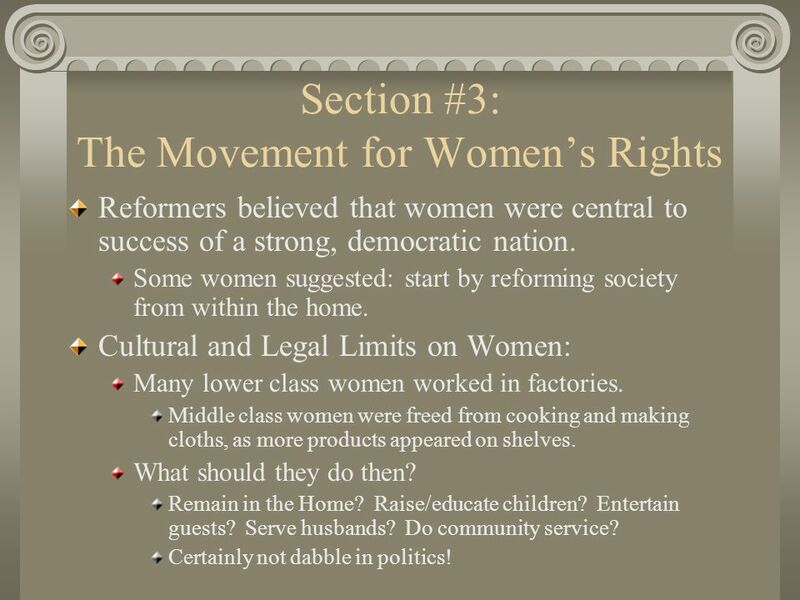 Some women suggested: start by reforming society from within the home. Cultural and Legal Limits on Women: Many lower class women worked in factories. Middle class women were freed from cooking and making cloths, as more products appeared on shelves. What should they do then? Remain in the Home? Raise/educate children? Entertain guests? Serve husbands? Do community service? Certainly not dabble in politics! 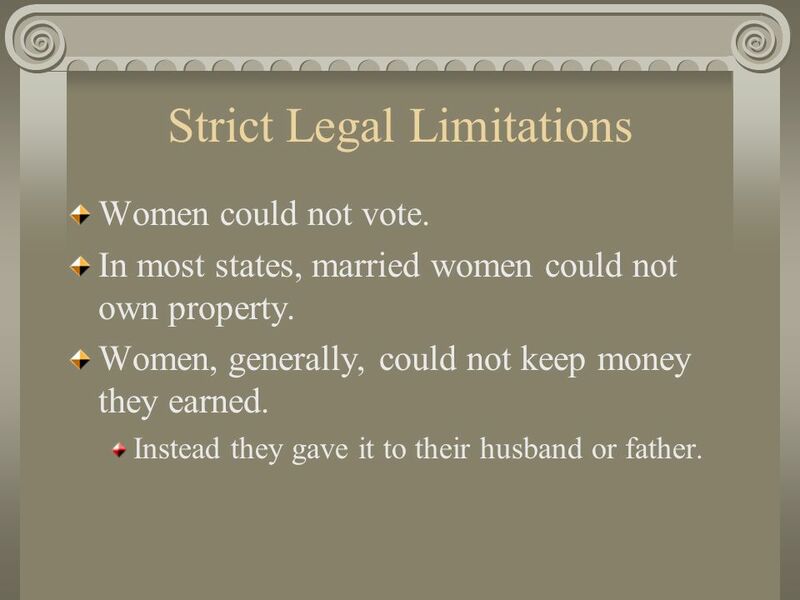 Women could not vote. In most states, married women could not own property. Women, generally, could not keep money they earned. Instead they gave it to their husband or father. 49 Public Roles for Women More women are becoming educated, more grow eager to apply their knowledge and skills beyond the home. Became angry with laws/attitudes that prevented them with doing so. Participating in a movement! 1st taste of the world outside family. Marched in parades, participated in boycotts, gave lectures at public assemblies. Many women began to identify with each other in their bad positions in society. Battle to end slavery is how women emerged into the political world. 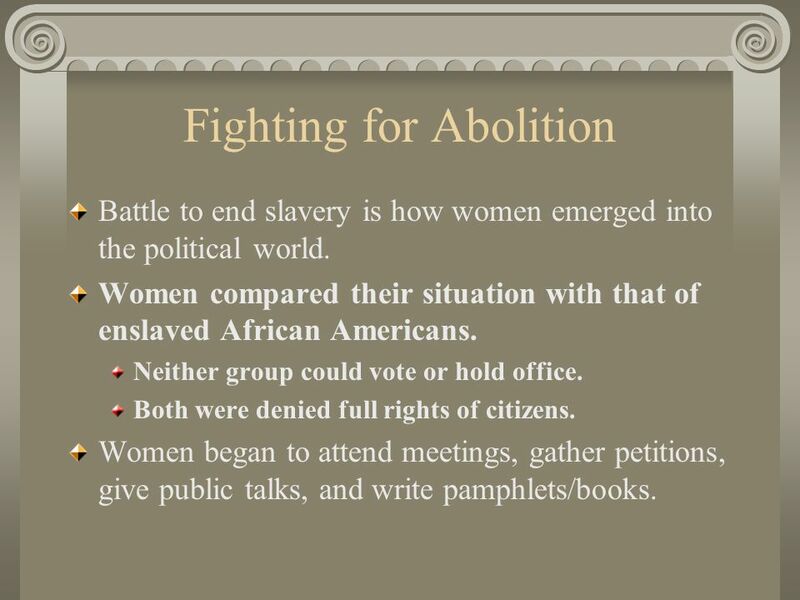 Women compared their situation with that of enslaved African Americans. Neither group could vote or hold office. Both were denied full rights of citizens. Women began to attend meetings, gather petitions, give public talks, and write pamphlets/books. 51 Male Opposition Many men were horrified with this development. 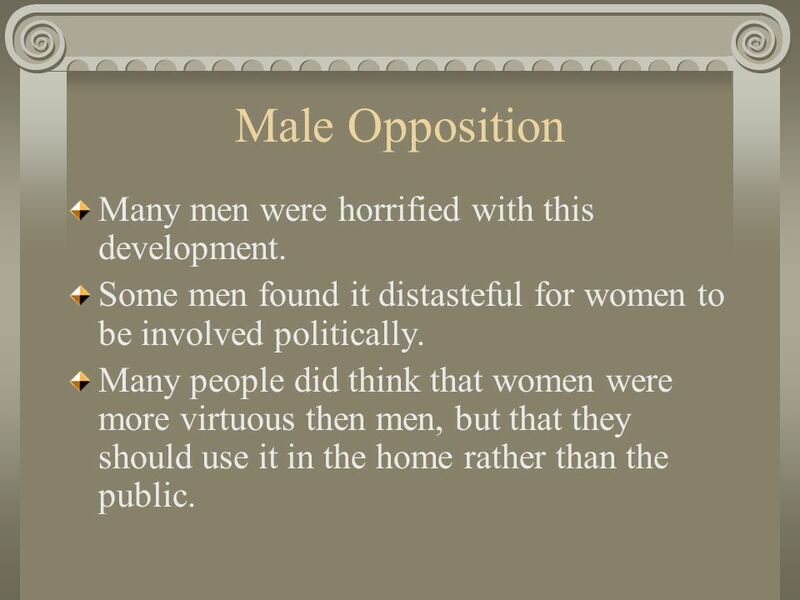 Some men found it distasteful for women to be involved politically. Many people did think that women were more virtuous then men, but that they should use it in the home rather than the public. 1840 – first World Anti-Slavery Convention in London. American women were not allowed to attend. 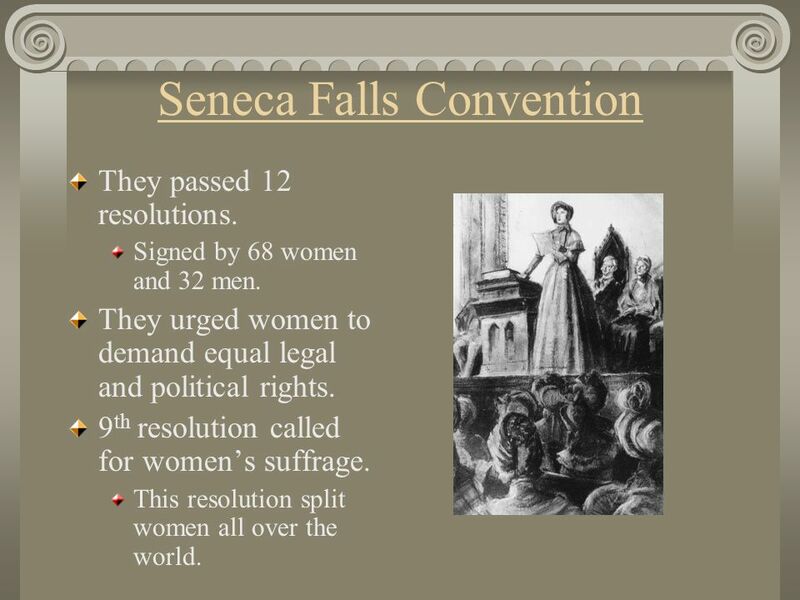 Two delegates said, “hey, let’s throw our own!” July 1848 in Seneca Falls, New York… first women’s rights convention in US History. 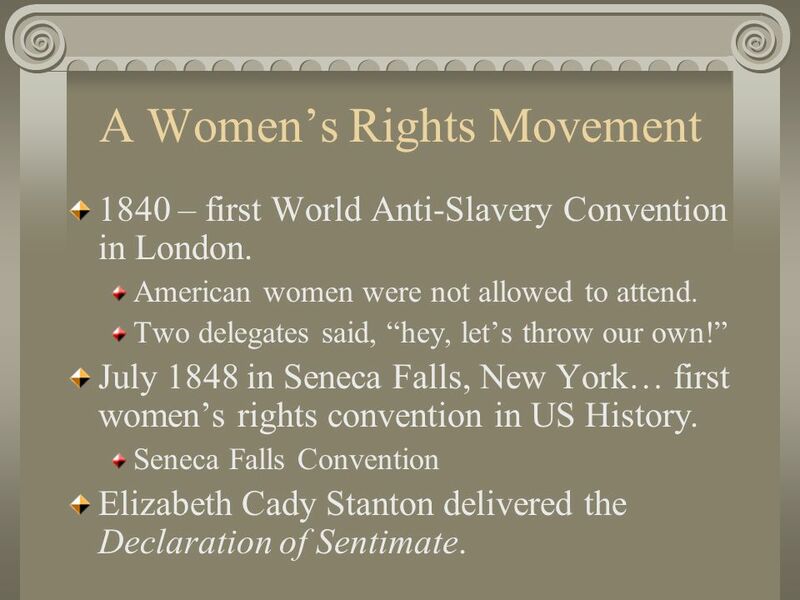 Seneca Falls Convention Elizabeth Cady Stanton delivered the Declaration of Sentimate. They passed 12 resolutions. Signed by 68 women and 32 men. They urged women to demand equal legal and political rights. 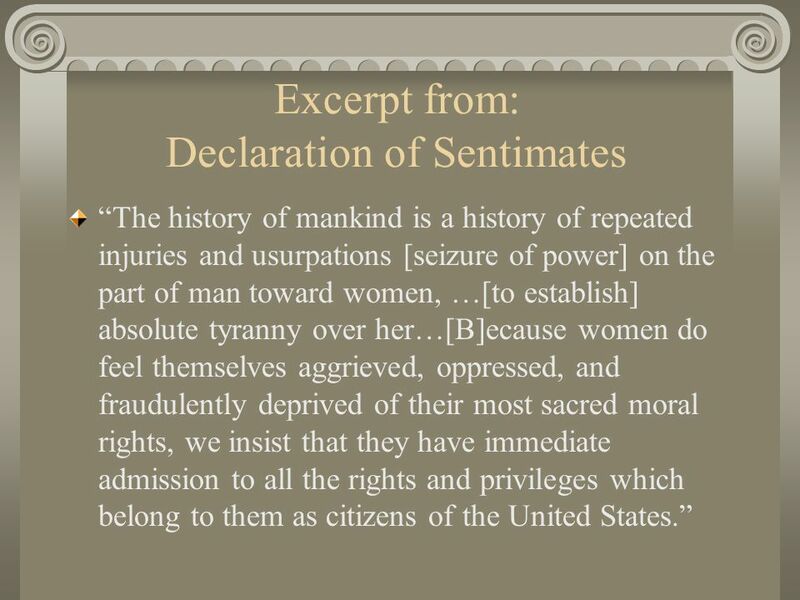 9th resolution called for women’s suffrage. This resolution split women all over the world. The S.F. Convention did not trigger an immediate downpour of rights. Most Americans still felt as though women should do improve society in the home only. By 1890 – more than 2,500 women/year graduated from college. Educated women began to appear in jobs that they had once been forbidden to do. 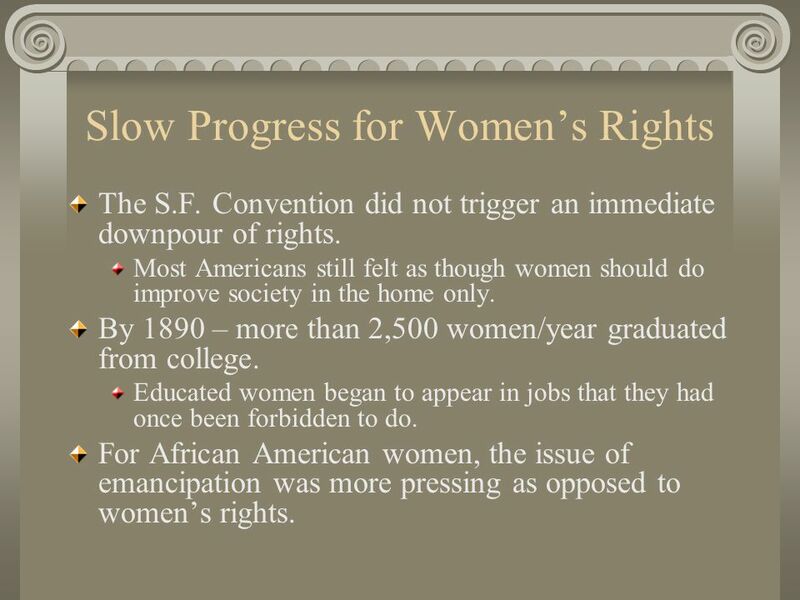 For African American women, the issue of emancipation was more pressing as opposed to women’s rights. 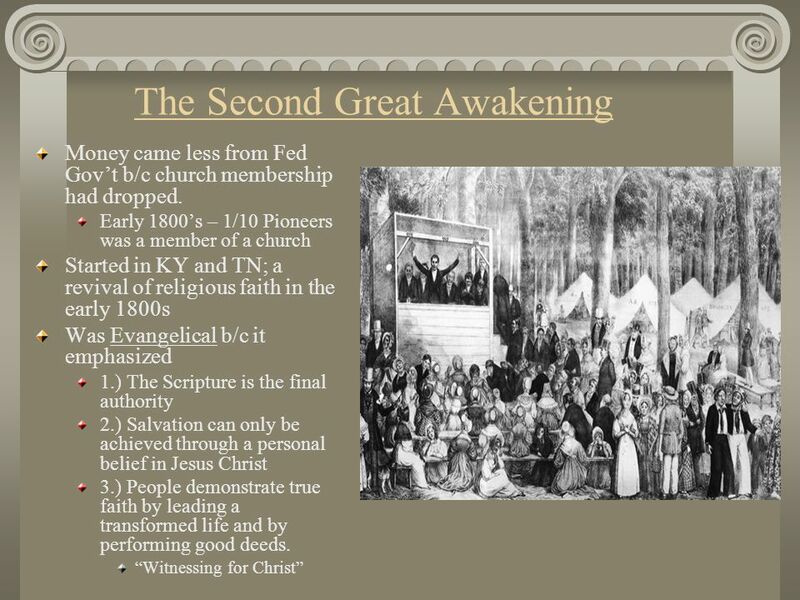 Download ppt "Unit Three Chapter Eight"
C ALL TO F REEDOM HOLT HOLT, RINEHART AND WINSTON Beginnings to NEW MOVEMENTS IN AMERICA (1815–1850) Section 1: America’s Spiritual Awakening Section. 8.2.  Slavery became an explosive issue, as Southerners increasingly defended it, while Northerners increasingly attacked it.  In addition, the abolition. Protestant Revivalists. What problems did Protestant Revivalists want to solve? Alcoholism, illiteracy, overcrowded housing, poor health care, abuse of. Religious Awakening Chapter 4, Section 1. 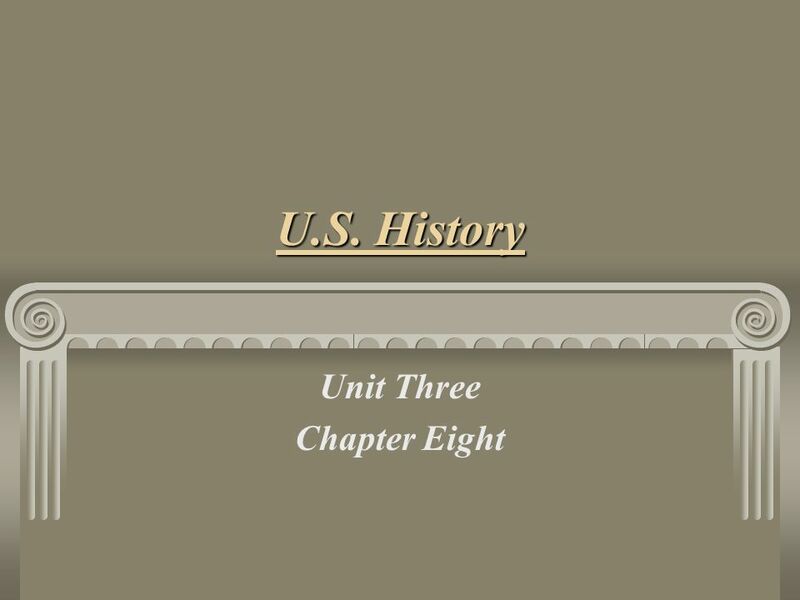 Chapter 9 Religion and Reform. Objectives Describe efforts in the North to end slavery. Reform The Age of Reform Changing American Life in the 19 th Century. 20.2 Northwest Ordinance. Standard Describe the significance of the Northwest Ordinance in education and in the banning of slavery in new states. Reforming Society What message did Protestant revivalists preach? 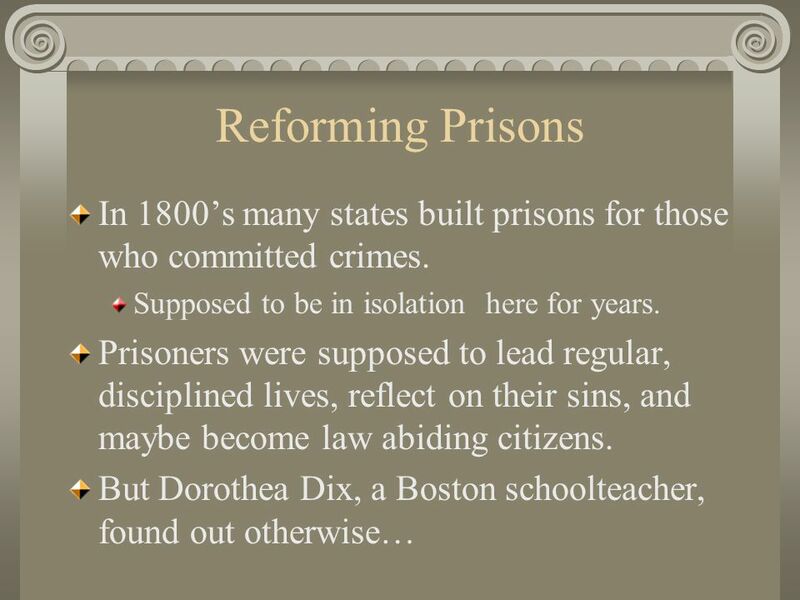 Vocabulary Ch.8 Sec 1 Horace Mann Social Reform Temperance movement Prohibition Dorothea Dix. C18: An Era of Reform. C18.2 The Spirit of Reform. The Ferment of Reform Second Great Awakening  Caused new divisions with the older Protestant churches  Original sin replaced with optimistic. THIS WILL BE ONLINE!!!!!!!. 8-3 Slavery Blair Burak, Allie Friedland, Danielle Haltzman, Lindsey Schmidt, Allegra Straub.